In the early 1900s, Prussian authorities forbade Danes living in North Frisia from raising the Danish flag, above. So they bred flag-colored pigs, below. 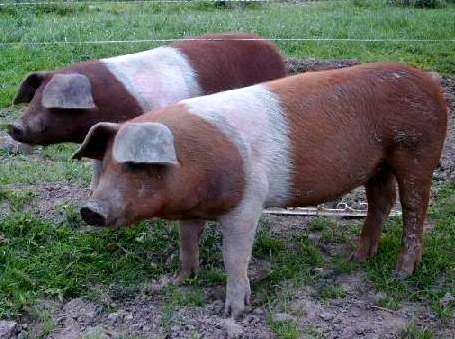 The “Danish protest pig” was probably developed by crossbreeding Jutlandian and Holsteinian marsh pigs, red individuals from the Angeln Saddleback breed, and Tamworth pigs from England. Only around 140 individuals exist worldwide, but Schleswig-Holstein is trying to preserve the breed for its cultural value.